By performing a DNA analysis of elephant tusks nabbed at ivory busts, scientists have successfully backtracked the contraband to three major African cartels. This application of genetics presents a powerful new tool in the ongoing struggle to stop elephant poachers. Back in 2015, University of Washington conservation biologist Samuel K. Wasser came up with what looked like a promising solution to Africa’s elephant poaching problem. By analyzing elephant poop and extracting DNA from stolen ivory, Wasser was able to pinpoint a pair of poaching hotspots in Africa. “Increasing law enforcement in these two hotspots could help curtail future elephant losses across Africa and disrupt this organized transnational crime,” he wrote in the ensuing study. Three years later, poaching is still happening at an alarming rate, with approximately 40,000 elephants killed each year for their tusks. It’s not that Wasser was ignored or that his idea was somehow flawed—it’s just that poachers are really hard to stop. Part of the problem, for example, is how easy it is for criminal organizations to find replacements for captured poachers. But the larger issue has to do with the sheer logistics of the matter. Around 1 billion containers are shipped worldwide on an annual basis, a statistic that’s not lost on criminal cartels. The huge volume of trade that goes on each day means it’s hard for customs officials to detect bits of ivory stashed inside a large shipping container. Wasser, fully aware of this problem, decided to take his research further. His new paper, published this week in Science Advances, shows that it’s possible to use genetics, and a bit of sleuthing, to trace the origin of seized ivory back to the traders themselves. And it’s not just a theoretical exercise; Wasser’s technique just exposed three major export cartels operating in Africa from 2011 to 2014, namely cartels exporting illegal ivory from the port cities of Entebbe in Uganda, Lomé in Togo, and Mombasa in Kenya. Wasser’s detective work involves DNA-based sample matching of elephant tusks, the geographical pinpointing of where the poaching took place (his technique of matching DNA from poop and DNA from tusks can geo-locate the origin of a recovered piece of ivory to within 185 miles), and the investigation of potential exit ports (such as shipping documents). Among his findings, Wasser discovered that two tusks from the same elephant are often shipped by the same traffickers in separate shipments, which tend to happen around the same time and from the same exit port. There’s also a high overlap in the geographic origin of the tusks and the trafficker. 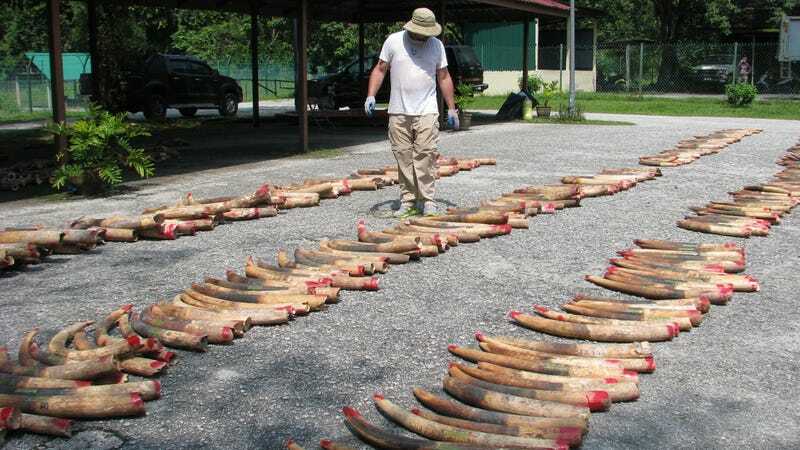 In terms of methods, Wasser and his colleagues sampled the DNA of tusks taken from 38 seizures from 2006 to 2015, including seizures made in Singapore, Malawi, Hong Kong, Cameroon, and other entry ports. The team found that 26 tusk samples were a perfect match for tusks found in other seizures, pointing to the practice of segregating tusks for shipment. So in addition to exposing the cartels, these findings can inform officials about the size of the cartels, their interconnectedness, and operational strategies. What’s more, it provides a more direct method for the policing of illegal trade in ivory tusks, and strengthening ongoing cases against cartels and individuals. “Targeting such cartels could have a major direct impact on combating the illegal ivory trade by preventing contraband from transiting out of Africa before it becomes far more diffuse and expensive to trace,” the authors write in the study. Armed with this new strategy, Wasser has already been in contact with the U.S. Homeland Security, as announced in a press conference held Wednesday. Poachers in Africa will now have to contend with a new foe: science.